Trevor and Natasha first met as history students at Kennesaw State ten years ago. On one of their first dates, Trevor took Natasha on a romantic drive through historic Acworth, where Trevor (who grew up in Cobb County) spent time as a kid. “She didn’t know about Acworth and I wanted to show it to her,” he says. 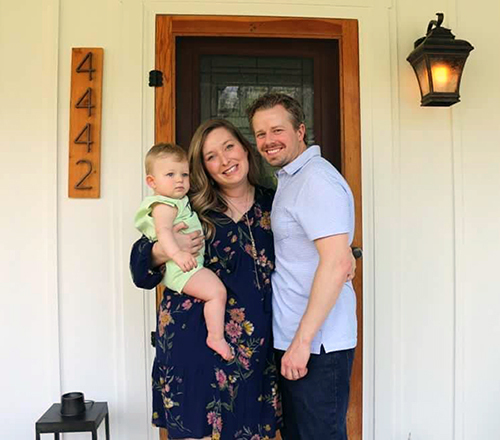 It must have worked: now, the couple is happily married, working in Cobb County (Trevor as the executive director of Cobb Landmarks and Natasha as a history teacher at Sprayberry High School), and raising their one-year-old son, Tuck, right here in Acworth. As both history buffs and young parents, Trevor and Natasha know all the good tips about Acworth: from baby-friendly brunch to date night spots to the historical sites they impress their out-of-town friends with. And they know how to have a good time, too: their big, beautiful Southern porch serves as a regular gathering place for neighbors and friends, especially when there’s an event just across the railroad tracks downtown. Where do you spend your time in Acworth? Natasha: I spend a lot of time at Pearl’s Spa. I like it because it’s a small downtown spa. That’s where I do all my shopping for my girlfriends for birthdays. Trevor: If I’m hanging out with people, we usually go to the bar at Henry’s Louisiana Grill. Natasha: We love Henry’s brunch on Saturdays. It’s very casual and affordable. We also like to go with Tuck because it’s baby-friendly. We don’t go anywhere that’s too quiet. What are some of your favorite ways to enjoy Acworth as a young family? Natasha: We’re always going to Logan Farm Park. We’re there at least two times a week, whether we’re going on a walk or we’re letting him play on the playground. We love the park, and the city has done a beautiful job with it. And the library does programs for infants and toddlers, so we go to their little weekly reading programs right downtown. Trevor: Tucker’s got our history genes, so he loves going to the Two LiRu Antiques and pointing at things. Natasha: The parks, the festivals, the events downtown… we’ll take him to the car show, to all the events down by the lake. There’s room for him to play here. Trevor: We’ll go to a restaurant downtown, and then have dessert and drinks at Brix on Main. Natasha: Pizza by Fusco’s is so good. It’s fast, so it’s good with the baby, and it’s very casual there. We love their pizza. Doro’s Italian is good, too. Also, on days when I’m out of school and we’re here for lunch together, we always go to Miss L’s Sandwich Shop. Trevor: She has good cakes and cookies, too. And it’s fun to be able to eat on Main Street on the sidewalk and people-watch. You’re both history nerds, and Acworth is full of history. What are some of your favorite sites? Natasha: I’m a huge fan of the Rosenwald School, which is right here next to Logan Farm Park. Trevor: I like the churches. Both historic African-American churches are really cool, Zion and Bethel, and they’re both in original condition. They were built in the 1800s and they all look pretty much the way they did then. And the Acworth Cemetery is cool, too. They have some Revolutionary War soldiers and Civil War soldiers buried there. Natasha: One of the other historic buildings we love, where we get to vote, is the Acworth Beach House (at Lake Acworth), which was constructed in the 1950s. Trevor: You’re standing there in this cool old building, and there’s the lake right there. You get to watch the sunrise over the lake. They built it when they built the beach at Lake Acworth, and it’s where people would change for swimming. Back in the 50s and 60s, that’s where everyone went to hang out. I’ve seen vintage postcards of Acworth Beach and they show everybody hanging out at the Beach House. What are some other lesser-known spots? Trevor: The mill village is great, and a lot of people don’t know about that. JD’s BBQ, that was the school, the old mill village store is the taxidermy place up on Southside Drive. Some of the little shotgun houses are still there, and the mill is still there. Here and there, in town, there are little cemeteries, so in the mill village there’s an old cemetery that no one really realizes is there. The Cowan House, that’s an antebellum house, and in the woods across the street, that’s where the family’s buried. It’s cool that they’re tucked in around us. Acworth always has something going on. What are some of your favorite events? Natasha: Most of the time, when they do events like the Acworth Beer & Wine Festival downtown, everybody comes to our house. All our friends from all over come, we eat, we go drink, and we come back and eat the leftovers. Our friends love to come here, they want to go to Taste of Acworth, they want to go to the beer festival, and we’ll just walk over together. And Acworth Art Fest is great — we never leave without buying something. Trevor: At the last Art Fest, we brought a blanket and food, and had a picnic by the railroad tracks. Natasha: It’s casual and comfortable and easy. What would your perfect day in Acworth look like? Trevor: With Tuck, it’d probably be brunch at Henry’s, a walk in the park, and then we’d go play at the playground. We’d have lunch at Miss L’s and go shopping. Natasha: We picnic a lot at the lake. If we were doing downtown, Pizza by Fusco’s. And then we’d put the baby to bed and come back out on the porch for a drink after bedtime. And on Fridays we do the Acworth Farmers Market. Natasha: …You know the business owners. I think that’s really cool.